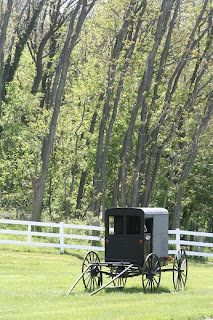 Mike and I spent the weekend in Lancaster County, the area of the United States with the highest density of Amish. Everything is a little bit different there, in an interesting way. We couldn't learn much about a society by just visiting for weekend, but we came away with a few observations. 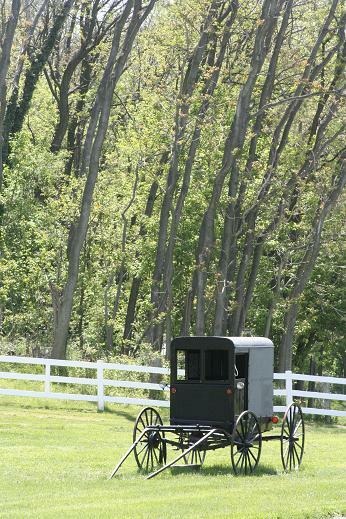 The Amish don't use cars and often get around in horse drawn buggies. One of the first things I wondered was how dangerous this has become with all the car traffic. Sure enough, when we visited the Amish Village in Strasburg, one whole panel showed newspaper articles about accidents involving buggies and debates about the safety of buggies. There has been some conflict between the Amish and their neighbors on this subject, and not all the arguments against buggies seem to have been very valid. It is silly to complain about horse droppings in the road when cars are responsible for so much air and noise pollution.. Worse, car drivers should not argue that the roads belong to them as apparently they have been doing. The Amish respondent pointed out that it is thanks to the Amish community and the tourists they attract that Lancaster is doing so well economically. He is right, first because they maintain the attractive farming landscape and produce goods of interest to people, but also because they offer an opportunity to see a different lifestyle. Buggies are part of the 'Amish tourist deal', and from my observation non-Amish are quite active in marketing and benefiting from that. We rented bicycles to cycle around the farm country, so we also had concerns about the car traffic, and different solutions to propose, neither of which are likely to fit in with American society. Mine was to ban cars throughout Lancaster County. I would allow large car parks at the entrances to the county and shuttle buses between the villages. Mike would like an alternative network of roads just for buggies, and presumably for cycling tourists. Interestingly, the Amish don't use bicycles. They use scooters (the kind kids usually have, not the motorized kind). By the time I had got saddlesore from cycling ten miles through the countryside, I envied them. Farm country is something of a rarity in the parts of the East Coast where I usually end up, so this was refreshingly open, gently undulating country. The style of the farm buildings isn't like anywhere in Europe that I know of, but the general impression is. In particular, the size and arrangement of home and utilitarian buildings is quite familiar. The twin silos of most Amish farms and the fans along the sides of the animal sheds are defining features. Looking out over a large expanse, the silos give the landscape quite an industrial air, but mostly it is green and pleasant. The fields are worked with machinery drawn by teams of horses, and just maintaining all the livestock needed to do that involves some pretty serious farming. Churches are such a defining feature of European rural landscapes that I noticed their absence. It turns out that the Amish hold church in their homes on alternate Sundays, rotating among the twenty or thirty families in their group. On the intervening Sundays, their bishop goes to hold the services for their sister group, whilst the group who don't have church visit with each other. Another thing missing from the landscape that is nearly ubiquitous elsewhere is the American flag. On the other hand, there is a kind of star symbol that is very common in Lancaster County. There's an irony in the fact that clothing chosen to deflect attention from the wearer makes the people who are wearing it into a center of attention. In fact, let's be honest about this, the Amish dress is part of the 'picturesqueness' that attracts tourists. Still, it's easy to see the point that within Amish society people conform to the expectation of plain dress. But I have always felt that clothes that attract attention are a distraction from the individual wearing them and in that context, uniform, plain clothing frames and emphasizes the person wearing it. I argue back and forth with myself about whether Amish clothing does, should or ever can achieve its stated goals. The Amish Village attraction included a visit of an old house done up to represent the contemporary Amish lifestyle. They use a strange mixture of old-fashioned techniques and appliances like oil lamps and appliances running on alternative power sources like diesel powered fridges. The Amish don't have decorations in their homes, but they do have decorative functional objects like clocks or calendars. The most surprising things to me in the house visit were the expressions of astonishment on the part of our American fellow visitors. They find this way of life different, astonishing, ... I find it to be quite close to that of all our not so distant ancestors. I can't help wondering how their grandparents lived, and how they come to have forgotten. We didn't meet any Amish people except to pass them on the street, where they are uniformly pleasant and friendly. I will say this about Amish life: some of it may be 'plain' but the cakes are not. I bought a sticky bun for lunch that was dripping with sugar. We got a small Shoofly Pie to take home. Shoofly Pie is a kind of cousin to the treacle tart but made with molasses. In the evening I tried Whoopie Pies for dessert. These seem to be the authentic ancestor of which the Oreo cookie is the degenerate offspring. They are made with two small(ish) pieces of sponge cake shaped like cookies, with cream sandwiched in the middle. Amish country draws a lot of tourists, and the main roads are filled with shops selling furniture, quilts, and well... basically stuff. A lot of it is kitsch, pseudo-cottagey junk, often with horrifically sentimental phrases written all over it. I can't imagine what it has to do with the Amish. If you look around a bit you can find some nice things. Mike and I went into a quilt shop where they sold lovely fabrics that reminded me of Provencal cloth. We also saw a quilt we would have bought if we had a home to put it in. Since it cost nearly $700, it's just as well we don't. I picked this hotel because it got good reviews on trip advisor. Looking at its outside, we had to laugh. Talk about kitsch! 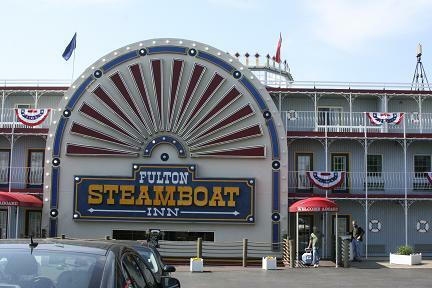 I think this is what they must call a theme hotel. It even has a moat running round it. The staff are referred to as 'crew members' (instead of 'associates'! ), and if you take full board they call it a 'cruise'. Despite this it is very nice, with large rooms, a hot tub and a fairly decent restaurant, so yes it is good value for money. Though hard to find, it was fun when we got there. Marsh Creek is basically a boating lake with a bit of parkland around it. We rented a paddleboat and had good luck spotting some of the local wildlife. Then I went all American and had a hot dog and pink lemonade. Hopefully, I have got that out of my system and don't need to do it again.